This morning it is beautiful, sunny and pleasant outside and about 75 degrees at 11:00. Before going to run our errands I decided to make us a "good breakfast" so we wouldn't be hungry and buy a bunch of extra stuff! 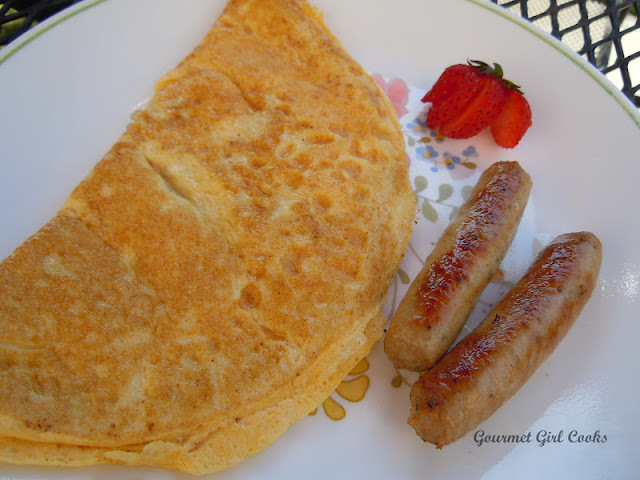 :-) I made simple and tasty cheese omelets using finely diced Kerrygold's Dubliner Cheese and a little black and cayenne pepper to give it some zing along with a couple of Bob Evans Turkey Sausage Links on the side. Along with our cup of Nantucket Blend coffee...it hit the spot. I snapped a pic below. Now...on to the business of the day...SHOPPING. Enjoy!